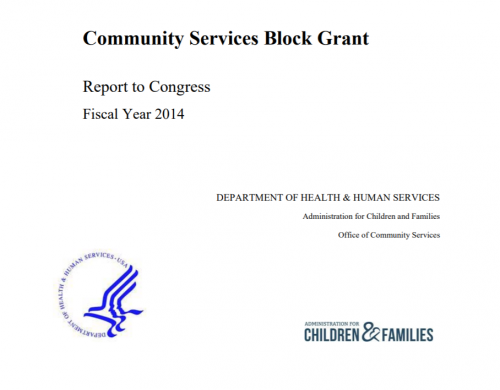 The Community Services Block Grant (CSBG) is authorized at Section 674 of the Community Services Block Grant Act of 1981 (CSBG Act), as amended by the Community Opportunities, Accountability, and Training and Educational Services Act of 1998 (Public Law 105-285) 42 U.S.C. § 9903, administered by the Office of Community Services (OCS), Administration for Children and Families (ACF), Department of Health and Human Services (HHS). The fiscal year (FY) 2014 CSBG Report to Congress, which includes the CSBG Performance Measurement Report, is mandated at Sections 678E(b)(2) and 678B(c) of the CSBG Act, 42 U.S.C. § 9917(b)(2) & 9914(c). Both reports are required to be submitted together to the Senate Committee on Health, Education, Labor and Pensions and the House Committee on Education and the Workforce by Section 678B(c) of the CSBG Act. The FY 2014 data for the CSBG Report to Congress was gathered by the Community Services Block Grant Information System (CSBG IS) survey, administered by the National Association for State Community Services Programs (NASCSP). The states, including the District of Columbia and Puerto Rico, provided information about the level and uses of CSBG funds, their activities, and the number and characteristics of families and individuals participating in CSBG initiatives.1 In addition, data were included on Tribal Uses of Direct CSBG Funds. HHS conducted evaluations of state compliance among all states during the reporting period through: (1) a state-by state survey, and (2) in-depth state assessments on the use of CSBG funds in the states of California, Hawaii, Illinois, Ohio, and Oklahoma. Unless otherwise specified, data provided span the period of FY 2014 only. The Appendices of the report provide more extensive information on the FY 2014 State Assessments and data pertaining to CSBG uses of funds, services, and client characteristics.